The following page is based on my guest speaker lecture that I gave several years ago to then the British Astronomical Association (B.A.A.) New South Wales Branch meeting, that was based on the once functioning large transit telescope at Sydney Observatory. I also gave a demonstration with the transit telescope, which is missing from this — but this will be added when I get some more images next time I visit Sydney Observatory. Figure 1 : Old Entrance to Sydney Observatory. This shows the ‘old’ front entrance of Sydney Observatory (1981). Note the transit instruments slits. The one on the right is where the present transit instrument is placed, while the old slit has been covered by the doorway. The alignment hole lies at the bottom of the right-hand slit covered by a cream painted piece of metal. When I was young, probably somewhere between the ages of eleven and twelve, I was fortunate enough to have been given a conducted tour on one of the public nights through Sydney Observatory. During 1972, as still is the case today, you could not visit this once functioning observatory without an appointment for nighttime viewing. To attend one of these nights, you had to book several months in advance, which required a phone call to arrange. After giving your general details and address, a letter would arrive several days later confirming the visiting date and time of. The same card was enticing, and stated you should come irrespective of the observing conditions. If cloudy, there would be alternative presentations. 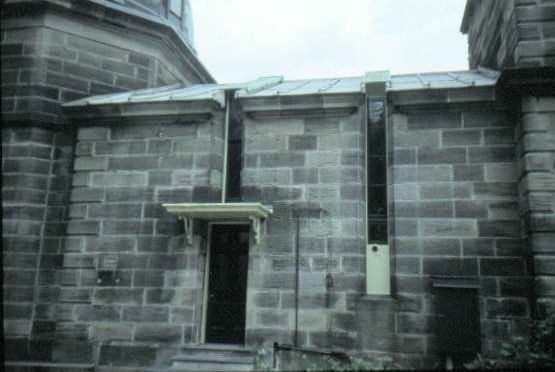 If you arrived at Sydney Observatory in the early 1970s, you would have found the visitors entrance along the south side of the observatory and right next to the unusual slit of the main Transit Instrument. This is different from today, as the entrance is now on the south-side of the building. To get to the door, you had to follow the gravel path to the rear car park, and then turn into a narrow bricked path that passed close to the stone pyramid, more correctly known as the thermometer shed that is over the marker and the stone of the trigonometric survey marker. The entrance of the doorway then was marked by some very well worn slate steps, which in central parts of both the third and last steps had worn down right to the sandstone. (See Figure 1.) Looking at the steps today, they have again been repaved since the observatory’s recent refurbishment. Illuminating the pathway, but more exclusively directed toward see the dark grey steps, was a overhead light that looks like it was probably designed in the 1920s, sitting on the overhanging roof above the porch. However, this entrance has not always existed. Originally this was part of the second slit of the transit room, where for a short time they once operated in tandem two transit telescopes. By late-1888, the then New South Wales Government Astronomer, Henry Chamberlain Russell (1836-1907) had reorganised the transit room to be divided — and this partition still exists today. This leaves the present transit telescope with the western slit becoming the older entrance. This change occurred after the installation of the 11½-inch f/13 Schröeder telescope in the south dome. After Mr. Russell had returned from Paris from the international conference undertaking the enormous Astrographic Catalogue project. These modifications became the observatory side entrance that I passed through as a child. I have assumed this passageway was designed so that visitors did not have to pass through the transit room while visiting the south dome. Yet the present roof, and above this door, still shows the position of this older slit. To enter the building, you had to push a doorbell that they surely was designed in the earlier 20th century. Frequently, if my memory serves me correctly, it did not work very well. At the designated time, the night assistant then greeted you, but this time on my first visit it was by the Assistant Government astronomer, later Government Astronomer, the late W.H. (Bill) Robertson. To the left of the entrance, was a huge old government bound book, with a well weathered spine, for all the visitors to sign. Usually, the first words was a request to sign this book. The next thing you noticed, was the musty air upon entry. This always seemingly highly traditional and noble, giving the impression of a well-used institution steeped with an interesting history — leaving the feeling that if “the walls could talk.”. At that time, you would then notice the small anteroom, which was decorated on all the walls with any old photographs in dusty frames of the southern sky — including the montage of photographs of all of the previous N.S.W. Government Astronomers. A small brass telescope sat on a small table, whose origin was once from the defunct Parramatta observatory. Also contained in this small area was an elegantly old-style celestial globe, dated to 1791, the 1820s 3¼-inch Troughton Transit Telescope, and the two tall ticking clocks made in 1820’s — again, all from Sir Thomas Brisbane’s Parramatta Observatory. For a time, most of this equipment was stored at the Powerhouse Museum, though these days it is lock behind glass on display after some much needed restoration. To the right was another door, which was nearly always closed, that lead directly to the transit room. At this time it was always dim, poorly lit and dusty. To young eyes, it appeared too wondrous, an echo of the astronomical past. Most visitors took little notice of this room — or even pondered its use — as they still do today. For me, I still pause here for several moments pondering the memories of the now distant past. For all the arriving visitors, the night assistant did not usually include the transit room on the nights’ agenda. However, there was the most enticing sound from the transit room, with the sound of incessant clicking of the clock hidden in the room. The picture of the transit room is very different today, but it is still recognisable from the Observatory photographs like by C. Bayliss in “Town and Country” on the 13th November, 1897, and some of those that still exist today that were also taken by Russell. Some of the fraying ropes, desks and cedar shelves cannot be seen there today. ‘Screwed-in’ circular rope loops attached the ropes that partitioned the north-south slits and opened either all, or just one slit. The hooks on long wooden rods, like some used on the old sailing ship of the 18th Century, hung in circular rope loops; either near the transit telescope, or stood angled against the walls. Some chronographic drum parts (dated to 1920, and made by Sir Howard Grubb and Sons.) and the associated electrical wires either are not there or have been trimmed down, especially around the table that once held the chronograph drum. Also missing, placed in storage for safe keeping, is the position or transit micrometer, it was at this time was always placed in the rear of the transit telescope. Surrounding the micrometer was the wiring that electronically placed marks on the chronograph drum (or recorder), timing each of the transit events. They conveniently attached these wires under the old traditionally designed carpet, where a small worn ridge had been made a visible impression. Outside the observatory very little has changed. Since the observatory change into a museum and for the badly need renovations, the transit telescope has been painted, and the transit room has had a new coat of paint. However, they have now relegated the magic and romance of the transit room succinctly to the distant past. The first astrometric measures were made by the Babylonians, but it was not until Hipparchus that a serious observation program of the stars and planets was undertaken. Hipparchus contributions made immense advancements into the science of astronomy. Unfortunately, His observations and reputation in regard astronomy were considered, even in his age, as brilliant. Today, even the most ardent critics do agree, he remains he true Father of Astronomy, or at least the greatest astronomer of antiquity. We know that Hipparchus built the first observatory on the eastern Mediterranean island of Rhodes, equipped with suitably accurate instruments to measure the planetary and stellar positions. Our only information on these instruments and his measurements are from Ptolemy who briefly mentions that Hipparchus between 146 and 126 B.C. made most of the observations We have accredited five major discoveries to him. a) He further developed the branch of mathematics known as trigonometry, which allowed calculations on geometric figures, especially with two and three-dimensional objects, that includes the circle and the sphere. b) He also developed extensive observations of the planets and the stars, producing the first star catalogues which we believe was inspired by a new star in 134 BC in the constellation of Scorpius and a bright comet. Ptolemy later used Hipparchus observations in his catalogue of stars, which he simply updated 270 years later. We believed 129 BC completed this work, and the catalogue listed 850 stars. Classification for each star was based on their magnitudes, close to the modern one. Positions were calculated very accurately, reported in terms similar to the latitude and longitude on Earth. This catalogue was also used by Edmund Halley 1,800 years later. c) By using the observations of the past, slow changes in the star positions were found, and by this he discovered what we now call the Precession of the Equinoxes. By his own catalogue, the bright first-magnitude star Spica appeared 6° from the autumnal equinox or the point where the sun crosses the celestial equator, from the north hemisphere to the south. A previous astronomer Timocharis of Alexandria had measured this value as 8°, some 150 years earlier. Hipparchus correctly deduced that it was movement was not due to the star Spica but it was the east-west movement of the Earth’s axis by precession. It is this movement that produces later and later times for the beginning of each season and the changing positions of the stars and planets along the ecliptic. He calculated the value for precession to be between 45 and 46 arc seconds per year, which is close to the current accepted value of 50.26 arcsec per year. Hipparchus had been remarkably close. This discovery is one of his best achievements, and keeps him among the best ever astronomers that the world ever produced. d) He discovered the simple geometric schemes that represent the motions of the Sun and the Moon. The motions of the planets he knew were based on the sun-centred or heliocentric system. He could not improve or drastically change the mathematics to the meet true positions of the planets. The representation of the orbits of the planets by the heliocentric system was still impossible to reconcile, especially for the orbit of Mars that was out by more than 1° than the theory predicted. The only advantage with the heliocentric system was that it was much simpler in structure. As the results were just as inaccurate as the geocentric system or earth-centred universe, proving which theory was correct was difficult. e) Hipparchus discovered the exact period of the Moon’s orbit around the Earth to be 29 days 12 hr 44 min 02.5 sec. This value is remarkably close, only differing too short by a tiny one second! From this result he could calculate a particular lunar eclipse to an accuracy of about one hour or for a solar eclipse to about 4½ hours. This result reflects the painstaking accuracy that he placed in his observations and the rigours in the mathematics. Unfortunately for all his genius, his contemporaries took little notice, as the size of the then known universe seemed just too incomprehensibly large to be true. This caused him some personal ridicule from other natural philosophers at the time, and the results of his great works were essentially rebuked. The discoveries of the precession of the equinoxes and his star catalogue will always remain great contributions towards the development of astronomy. Today, Ptolemy is not perceived as the most important of the astronomers from antiquity — yet he has certainly gained the best notoriety. His major works that have been passed down to us in their complete form, unlike his contemporaries in which we have only fragments or from here-say from other writers. The major work produced by Ptolemy was “Megalle Syntaxis tes Astronomias” meaning “The Great Astronomical System” that simply is called the “Syntaxis”, in which he gives the chronological history of the Greek astronomers in the five centuries before his time. Syntaxis come down to us from the Arabs, under the title the Algamest or “Kitab al Magisti”. From this Arabic form, it became the major textbook through the middle ages on the instruction of astronomy. This book describes Ptolemy’s own geocentric theory of the planets and was used for nearly 1 350 years until the time of Copernicus. His theory has been thought to be an adoption of the works of many others. We think his belief in the geocentric theory to be based on the writings of Plato (c.420 B.C − 340 B.C). Plato held the belief, similar to Pythagoras, that the entire Heavens were based on the harmony, symmetry and the exactitude of mathematics. To achieve this perfection, the gods intentions were to have all things spherical. All spheres they argued, were the most perfect figures of all. Hence, the shape of Earth and the orbits of the planets had to be also to be based on the sphere. Assuming the Earth itself was the centre of gravitational force, all bodies including the planets must always yield to its power. This leads to the conclusion that the Earth is the centre of the Universe. Plato’s logic tempted Ptolemy into a true belief in the geocentric universe. Having access to the writings of the most notable of astronomers from the famous Alexandrian Library, each concluding that the heliocentric or sun-centred universe was more likely correct. Yet Ptolemy still dismissed it. If Ptolemaic system was to work, the geocentric form of circles for the planets orbits must be suitably adapted. This meant that the retrograde motions of the planets, for example, needed to be explained. Ptolemy introduced idea of geocentric epicycles. The planets orbited in circular orbits, in which smaller circular orbits, called epicycles, orbited within the main system. The method kept all orbits circular but was obviously very clumsy and complicated. Ptolemy’s book also contains a star catalogue that was taken almost in its entirety from the Hipparchus catalogue. Ptolemy had added his own observations, with most of the positions of Hipparchus changed in epoch due to the effects of the precession of the equinoxes. We know he copied most of this work, as many mistakes made by Hipparchus were directly translates as Ptolemy’s. This catalogue is still in use today, being the basis of an historical record of stellar positions. Al-Sufi (903-986 AD) was employed as court astronomer and teacher of astronomy to Prince Adhad al Daulet, who eventually ruled all of Persia. He made observations, and produced a catalogue of 1,018 stars that included star magnitudes, colours and positions, named the “Book of the Fixed Stars”. We luckily have this book in its entire form, and numerous fragments of his other publications. This book was an update but also based on Ptolemy’s “Megale Syntaxis”. Inthis book he revised all of star positions of Ptolemy. Each part, was elaborately illustrated with beautiful drawings of the constellation figures. From his latitude, in today’s southern Iraq, he observed many southern stars, such as Canopus and the star cluster around the star Omicron (ο.) Velorum. Such observations of stellar positions did not seriously again occur until the 15th Century. Later Ulugh Beg (1394-1449AD), who was born in Sulaniyya in Central Asia in Persia on the 22nd March 1394, improved these observations. By the age of fifteen, he had become the ruler of Samarkand, succeeded the throne of Persia in 1447, where his son murdered him on the 27th October 1449. He did, however, built the largest non-telescopic observatory in the eastern world. One of the first systematic measures of the positions of the stars and planets was begun by Tycho. Tycho persuaded King Frederick II of Denmark to allocate monies for an observatory. The construction was vast and elaborate and was appropriately named Uraniborg (Castle of the Heavens). This observatory later provided the important data that Kepler used to calculate the planetary orbits. One of the first observational uses of the Observatory was positioning the bright comet of 1577. Tycho noted that it varied in its velocity, which was hard to explain, but it also did this rather erratically. Obviously, the comet had to pass through the theory of the crystalline spheres, and this observation could only conclude that they did not exist. Tycho also noted the change in the apparent lunar positions from different locations throughout Europe, later called parallax, and showed it could be used to figure out the lunar distance. Using all these postulates, he correctly concluded that the comet was actually several times more distant than the Moon. Although not mathematically trained, his observations were of the highest precision and accuracy. He discovered, for example, the length of the year to an accuracy of less than a second. This single advanced significantly helped to the adoption of the Gregorian calendar in November 1582. He also contributed improvements in both measurement and design, and manufactured various instruments, like the astrolabes, quadrants and equants. He was first to discover refraction of light through the Earth’s atmosphere. This showed that the true position of the star would be actually lower than its apparent position in the sky, especially when near to the horizon. He worked out how to fix this anomaly, which is determined by knowing the true height or altitude of the star above the horizon. Between the 1700s and the early 1800s these goals were slowly obtained. Naturally, other practical uses were also found and the observers promoted these with vigour at the time. Common sense told that the pure research into the stellar positions would not be easily funded unless there was a practical use. The Western world at this time expanded. The discovery voyages, for example, both Christopher Columbus and Ferdinand Magellan showed that the Earth was not only spherical, but had economic and material viability, especially in the colonisation of the New World. The journeys of these explorers were fraught with danger, especially regarding the navigation of the oceans. It is obvious navigation of the oceans, having knowledge celestial objects was important so they could be used for position the observer on the Earth. In importance the Sun and the Moon became the tools for navigation, and began to establish the process known as dead reckoning. The positioning at the time of the Portuguese in the 1650s (like Magellan) was crude. A sailor could establish the latitude of his ship to about fifty kilometres, but had no means of finding the position in longitude. We did not make the first longitude positioning until 1767, and this was based on knowing the time accurately by using a ship’s chronometer. By the analysis of the position of the Sun and Moon against the background stars, the nautical tables and instruments were vastly improved. Eventually this lead to the rapid expansion by fleets of ships exploring all the oceans of the world, like the voyages of Captain Cook, and in the case of Australia, the discovery and eventual establishment of the mainland colonies. Production of these positions lead to the publication of the annular publication of the Nautical Almanac, that started in 1767. Together astrometry held sway with all governments, so they funded them, but only meagrely at first. This offshoot meant that astronomers held some practical advantage, and in turn, provided astronomers with the means of pursuing the true nature of the Universe. Fraunhofer in the 1820s developed another angular measurement device called a heliometer. Initially the telescope was developed to measure the diameter of the Sun to deduce the true eccentricity orbit of the Earth. This was later adopted to be used to observe the stars. The heliometer comprises the split objective, which could be manipulated to merge the solar disk, or two separated stars some distance apart. Mounted on an equatorial mount, apparent separations became true measured separations. This instrument measured the first proper motions and parallaxes. By 1830, 61 Cygni, or well named Bessel’s Star, given after Bessel and Groombridge found the very large proper motion of 7.07 arcsec per annum. This was followed in 1834, the trigonometric parallax was found, which needed small corrections as the method was improved, as 0.33 arcsec. (330 mas. ), indicating 61 Cygni was one of the nearest stars. All these devices were typically used to determine the planetary positions, by they were used also in determining star places in the heavens. The transit telescope is an instrument in a long series of improvement in designed. In the days of its use it was also known as the universal instrument. As a group that started from the quadrants and meridian circles of ancient times — with the telescope attached instead of looking alone a fixed straight path. The transit telescope was established as a primary instrument somewhere between 1760 and 1780. Its use is based on the determination of the time when some star crosses the meridian at the place of observation. When accurately determined, of which the transit telescope is the most famous, this place marks the local sidereal time, and hence, the true apparent time for that longitude. The precise graduated circles also give the star altitude on the meridian from the zenith or northern and southern horizon — simply based on these two values, thus obtaining the precise longitude of the location. We measure longitude from the position of the transit telescope at Greenwich Observatory in England, now parts of the National Maritime Museum. This instrument marks the internationally agreed zero longitude of the world. The precision of mechanical devices at the time of the pre-Industrial Revolution was inadequate for the highly accurate needs of astrometry. They faced two problems; the accuracy of screw threads and the high precision needed in milling graduated circles. For example; 1.0 arcsec (arc seconds), represents the required accuracy for two-metre meridian circles to one hundredth of one millimetre. The instrument makers of the company of J. Repsold in 1802, who made first accurate circles that were suitable for astrometry and then by Reichenbach in Munich in 1804. The first meridian circle of note was by Reichrenbach’s, and was used by Bessel in Prussia. Each of these circles was initially used for geodetic work, which they later adopted for improvements in sextants in use for navigation. Similarly, trigonometry developed the mathematics in obtaining accurate star place, latitude, longitude and the ability of handling astronomical corrections. The oldest methods for accurate transit telescopes date to America in 1844. Instead of looking at a star and listening to the ticks of a clock, observers registered the moment of transit across the cross-hairs of the micrometer by trapping the signal key set to a chronograph, with the clock registering the time in seconds. Using this method, accidental errors were reduced from 0.5 sec to 0.06 sec in time. Multiple measures across the graticule further improved the results using several parallel wires, and reduced the systematic errors. The mathematically talented German astronomer Bessel in the 1810s developed the new astronomical field of precision astrometry by improving instrument designs and developed some mathematical methods to improve accuracy. Due to this work early in his career, he started to reduce the vast backlog of data produced in the years before. I.e. Mostly Bradley&38217;s observations, but also some others. Bessel then joined with the English astronomer Bradley, analysing his observation because of Bradley’s precise measurements with their known errors. It was from these accurate analyses that both Bessel and Bradley discovered the sources of errors, like nutation (about 8 arcsec), the aberration of starlight (about 20 arcsec) and refraction. The culmination of these results lead to the first set of astronomical constants in the “Fundamenta Astronomiae” in 1818. Errors were typically between 1/1000th and 1/100th millimetre for the measurement, combined with atmospheric refraction, temperatures, pressure, time of day, etc. Next was the need for corrections for precession, nutation and light aberration. The reductions by the 1850s fell to 0.01 arcsec in declination, and 0.001 seconds in Right Ascension. In 1848, George Airy, helped by the engineer Charles May, built the first modern transit circle, now called a transit telescope. Its first use did not occur until 1851. Three years later, transits were also first timed electronically by Airy , when he had first reduced most of the planetary and stellar transit data when coming into office as Astronomer Royal in 1835. He then held this position until 1881. At the time, the English had mostly lagged behind most of these technological aspects, but British pride presented by the King was beginning its ascendency. Under enthusiastic Airy, and due to Greenwich’s unbroken series of observations, Greenwich became the new centre of world affairs for navigation by sea, astrometry and geodesy. Greenwich under him also grew during this time, both nationally and internationally. All meridian work developed in a set up positions for so-called fundamental stars. Bessel set up the 3,436 stars. This was later increased by “zone work” for all the stars, which developed (as a natural progression) into the Astrographic Catalogue of stars between the 1870s to 1880s. The problems of the southern sky became paramount, and the legacy of southern astrometry beginning late compared with the northern stars, lead to poor knowledge of stellar motions even into the 1960s. The first accurate portioning and parallax culminated in the southern hemisphere with the SAO (Smithsonian Astrophysical Observatory Catalogue). Here the precision of this data is slightly poorer compared with their northern cousins. Recently, the Hipparchus satellite improved the data. Released in August 1996, the parallaxes for some 100,000 stars were obtained, and we changed the role for transit telescopes forever. William Dawes made first astrometry in March 1788. This was mainly to set local time and standardise the longitude and latitude of Sydney. His second goal was to observe the positions of the return of a periodic comet, which never came about. 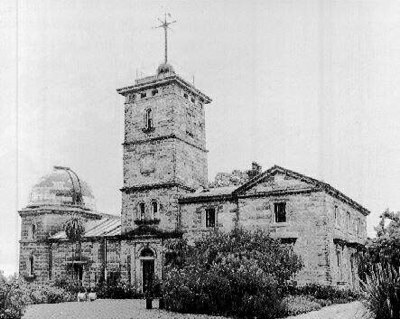 Next Parramatta Observatory was established in 1821. (34 years after the arrival of the First Fleet.) It began observations in the next year, under the directorship of Sir Thomas Brisbane, and the two observers Rümker and James Dunlop. Brisbane defrayed the original cost instruments and the wages of two observers himself. In the years after about 1836, Parramatta Observatory fell into disuse , so astrometry progressed sporadically — mainly to the determination the local time by the measures of the sidereal time. Stellar positioning only re-emerged in the mid-1850s. The meridian telescope of the old Parramatta observatory was sent to England for repairs in early 1857, and was returned in late in 1858. Reverend William Scott had arrived in 1856. After being nominated by Airy himself, who was highly he was interested and motivated by astrometry, he began almost immediately when Sydney Observatory was completed — started his work on 5th December 1868. Scott particularly observed stars culminating near the zenith, and towards the south celestial pole. His work was meant to be extended (according to Airy) at the Cape of Good Hope and the results climaxed in two published volumes in 1859 and 1862. H.C. Russell continued this programme and work, who was primarily enlisted because of recent graduation from the University of Sydney as dux of mathematics and physics. The Transit Telescope at Sydney Observatory, replaced the relocated the Edward Troughton 3¼-inch Transit Telescope, from Parramatta Observatory, which was made in 1820. The transit telescope, is the 6-inch Transit Circle Troughton and Simms instrument that was made in 1876, as order and organised on the behalf of the NSW Government, by the English Astronomer Royal, Sir George Airy. The manufacture was concluded in March 1876, so it is now more than 120 years old. The first observations started in 1877, but because of this was in the middle of the two transits of Venus (1874 and 1882) and Russell’s other undertakings, Russell devoted a small percentage of time to the extensive observation programme. However, Russell did carry out positional measures of the Tebbutt’s Great Comet of 1881. In 1878, the Observatory was also responsible for the surveying. The Government decided to handed over this work to the New South Wales Lands Department, whom from then on produced the detailed trigonometric survey of NSW. This year also marked the deviation of non-astronomical ventures by Russell, required by the elected Colonial government. A nominated Board became then responsible for the Observatory running and requirements of capital works and funding projects. (Probably under the direct influence Russell himself.) This broke away from the directions of single-minded Airy. From then on, transit observations became very sporadic in the next few decades. The introduction of the Astrographic Catalogue replaced many of the observations that the transit telescope was supposed to fill. However, the central positions of the plates were checked from time to time, and in some ways, both the transit and the Astrographic Camera were really used in tandem. In the 1920s, W.E. Cooke initiated the last true positioning of stars using the transit in the survey of 1,068 stars within the Astrographic Catalogue. This was completed successful but was greatly hindered by the encroaching light pollution from the city of central Sydney. It is fascinating to see that astrometry has remained very prominent throughout the history of Sydney Observatory. This is despite the worldwide direction of the astronomical community moving towards the sub-science of astronomy; namely, astrophysics. Usual the first established areas of transit telescopes are the azimuth piers, that give the telescope the north-south alignment. This would have been field tested with a small transit telescope or theodolite. The first is made using two wooden pegs some 150 to 200 metres away, and secondly using an alignment telescope. Originally, it would have been marked by the temporary stone pier, and some ten of metres away to the north and south of the position of the transit instrument. The important 5.0cm (2-inch) alignment refractor on the north side of the transit room was placed when not in use in a wooden box. A hole in the wall aperture is for this instrument alignment. It is used for checking the actual north-south line, that must be occasionally checked, and is place in case of misalignment either by accident, sagging of land or earthquakes. This also allows the mechanism to be aligned east-west by another alignment telescope or by a mirrored arrangement. Normally this alignment is through the centre of the altitude-azimuth axis and also passes through the centre of the transit telescope. The telescope itself is placed between two fixed piers, supporting the graduated meridian circles, and is more properly called the vertical circle. Towers towards the west an east hold the meridian circles, are made so they can be independently aligned. Each tower has a set of alignment screws, that is adjustable outside their respective cabinets. The vertical circle, and other mechanical information is then extracted by the various eyepieces around these adjustments. Initially, these were illuminated by gas light, but were replaced around 1910 by incandescent lights using electricity. The observer placed the telescope alignment to the declination of the star in question. Next the observer is placed under the telescope and waits until the star in question entered the field. A single transit is never taken, as multiple measurements prove to be much better to decrease the errors. Originally, stars are measured by the ear/eye method, but this was soon replaced by the electronic signal sent to the drum chronograph. The chronograph produced regular ticks on the graph paper in the drum, except for the 59th second. Later, some results on other similar instruments actually printed the time. Observers simple to pushes the button when the star was occultated by the micrometer wire, that placed a permanent mark on the paper that was wrapped around the recording drum. Results, could then be calculated later at a time more convenient the astronomer, especially if the position of the star was required. Otherwise a brief calculation, could be used to adjust clocks and other chronometers to give the correct sidereal or local time. Transit telescopes were eventually replaced by the portable theodolite (1908), with the last Airy Transit of this generation was made in 1888. #1 : Hipparchus, or more correctly Hipparchos, was born in Nicaean Bithynia. We have very little information on his life or any of his personal qualities. We know that he was not a philosopher, but it was his mathematical techniques and analysis that gave him fame. Unfortunately, all books written by him, save one of his unimportant works, have been destroyed. Details of Hipparchus (and Eratosthenes) are given in Pliny’s “Historia Naturalis” (Natural History). Pliny (23 AD.−79 AD.) describes him as a major contributor to science and summarises his achievements. #2 : Some of Hipparchus mistakes, for instance were duplicated by Ptolemy. #3 : Claudius Ptolemaeus Pelusiniensis or Ptolemy (c.90 - c.141-151 AD) was born, it is suggested, in Ptolemaic Hermii on the banks of the Nile. His date of birth and death are uncertain, however we know he was a geographer and an astronomer, living and working in Alexandria. In this city, he is believed to set-up an observatory on the high roof of a temple. Ptolemy is thought to have died at the age of seventy-six years old, in either 141 or 151 A.D.
#4 : Tycho was born into nobility in 1546, in Kudstrup, South Sweden under the then Danish Government. In his later life his most distinguishing feature was that he had a gold nose, that was lost in a sword duel. His personality was said to be abrasive, to the point of almost being rude, and with the aristocracy he was considered a drunkard. He became interested in astronomy at a young age of thirteen or fourteen, until his observational interest increased by the appearance in the northern constellation of Cassiopeia with a “new star” in November 1572. This star continued to increase in brightness over several weeks to become as bright as Venus. It remained in view for a few months before it fell again fell below naked-eye visibility. This amazing star was later classified as an exploding star or supernova. Tycho did not have any significant academic background, and as such, was was not talented enough to properly analyse his data. Yet when it came to observation, he was dedicated and exact, especially with his non-telescopic equipment. When his patron, King Frederick II died, Tycho left for Germany in 1597. Eventually he travelled to Prague, at the request of the emperor, to become the Assistant Astronomer. Subsequently he was introduced to Johannes Kepler who was also employed under King Frederick II. Kepler saw, and gratefully accepted Tycho’s tables and observations, that continued other important developments with planetary motion. He died in Bentatky, Prague on the 24th October, 1601 at the age of fifty-six, possibly from excessive drinking during his later life. #5 : These were the ancient instruments to measure stellar or planetary objects as they travelled across the celestial sphere. #6 : Anson in 1741 knew this problem directly. He had underestimated, guessing wrongly of his longitude. Distance at sea was typically made by travelling along a parallel of latitude and roughly estimating the distance travel by the speed of the ship. His crew, and nearly himself, suffered from loss of live by scurvy, and in his case, loss of life in a shipwreck. #7. : This, like the instrument at Sydney Observatory, is more correctly called an Airy Transit Instrument. #8 : Sydney contribution to the Astrographic Catalogue finished in 1964. Sydney took over the Melbourne Observatory portion of the catalogue in 1944 when Melbourne Observatory was closed. The final publication of the Astrographic volume No.52 concluded the work in 1971. The entire work measured over one million stars in the declinations from −36° to the south celestial pole. #9 : The actual transit observations are relatively simple to undertake, (a common fault with most of the astronomers at the time who saw them as “cannon fodder”, and therefore paid for their assistance a pittance. (except Flamsteed between 1660 to 1680.) However, the reductions for the positions were very difficult, so the astronomer typically took all the credit. The mathematics, once the procedure was organised, could be done by computers; operators who did the tedious calculations by hand. #10: James Dunlop in 1828 was similarly awarded the Gold Medal for his observations and catalogue of 621 nebulae and clusters and his 253 double stars. Most of these were discovered during the period when the observations were being made for the Parramatta Catalogue. It seems that the majority of these transit observations were actually made by both Dunlop and Rümker. Later during 1858, Rümker was to be recognised by the Royal Astronomical Society for his contributions in many if the observation made at Parramatta. #11: Today, the only visible existence of Parramatta Observatory is the transit piers, located near the south-eastern entrance of Parramatta Park, some three hundred metres from the building of the old Colonial Government House. #13: This was removed in May, 1987 and placed into storage.